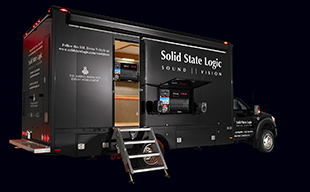 OXFORD, ENGLAND - Solid State Logic is extremely proud to announce the release of XL-Desk, a modern twist on the classic analogue studio console. XL-Desk is designed for tracking or mixing engineers who require the sonic and workflow benefits of an analogue console within a DAW centric studio, but don’t want or need the integrated DAW control and analogue level automation other SSL console products have made the new hybrid studio standard. XL-Desk is in many ways a traditional 24 into 8 analogue console but it packs in a compelling collection of features; 40+ inputs of SSL SuperAnalogueTM summing, an inbuilt 18 slot 500 format rack (with an SSL Stereo Bus Compressor pre-loaded), 8 SSL VHD mic Pre’s on board, four stereo Mix Buses, a fully featured monitoring and talkback section (with an SSL Listen Mic Compressor) and an incredible array of connectivity and routing options. It is the perfect analogue centre piece for a modern DAW focused studio. Users of SSL large format consoles will be instantly familiar with the wealth of workflow options made possible with XL-Desk. It has 20 channel strips: 16 dual input mono (switchable between main input or DAW return) and 4 stereo channels. The first eight mono channels have SSL’s uniquely versatile VHD mic pre’s. There is an 18 slot 500 format rack built in that can be used for processing or mic pre modules. XL-Desk ships with a legendary SSL Stereo Bus Compressor module in slots 17 & 18 (hard wired to Mix A). The rack has its own dedicated high spec’ power supply. There are four main Mix Buses (A, B, C, D) with buses B, C and D able to be summed into Mix A. The Buses and channels can access the 500 rack and each have a separate insert point for other processing and/or use of a patch bay. The 500 format rack also has rear panel I/O connectivity to enable the rack to be used with a patch bay etc. Direct Outputs on every channel, stereo return and mix bus enable convenient stem printing back to your DAW. There are two mono aux sends and two stereo return inputs. Each channel has a Cue Stereo Bus section (with Pan and Volume) used to provide one of two foldback mixes while tracking. At mixdown the mono channel DAW return signals can be routed to the CUE ST bus and then summed into Mix A, so there are 16 main faders + 16 Cue ST inputs + 4 Stereo channels providing 40 summing inputs (using the stereo returns and insert Sum functions you can squeeze in over 50 summing inputs). A second foldback is available sourced from Aux 1 and both foldback A and B have individual talkbacks and a built in Listen Mic input + classic compressor circuit (with its own direct output). There is also a fully-featured monitoring section with bass management (3 sets of stereo speakers + subwoofer) and controllable Dim/Cut. XL Desk will be available from the end of October 2014. XL-Desk is available with the 500 format rack empty or fully loaded with 16 x SSL E-Series EQ modules priced from: GBP £11,750, euro €14,749, USD $19,999 excluding VAT or local taxes.